Team Canada nearly stumbled its way into the world junior hockey championship. The Canadians saw a 3-0 first-period lead melt away against Switzerland on Friday night, Nicolas Roy staving off a potentially worrisome defeat on the eve of the tournament with the overtime winner. It was a real jolt to the Canadians, who won their first two pre-tournament games by a combined 10-0 margin. Nico Hirschier scored a pair for the Swiss in the second period after Canada raced out to a 3-0 lead in the first seven minutes of regulation. Dominik Diem tied it at three moments into the third before Roy banged home the winner in overtime, the six-foot-four Carolina Hurricanes prospect pouncing on a Philippe Myers’s shot that sailed wide of the goal. Carter Hart yielded three goals on just 14 shots. Head coach Dominique Ducharme wouldn’t confirm him as the starter for Monday’s preliminary-round opener against Russia. Strome got it started quickly for the Canadians, beating Joren van Pottelberghe with a shot from the right face-off circle on a power play one minute 35 seconds into the opening period. 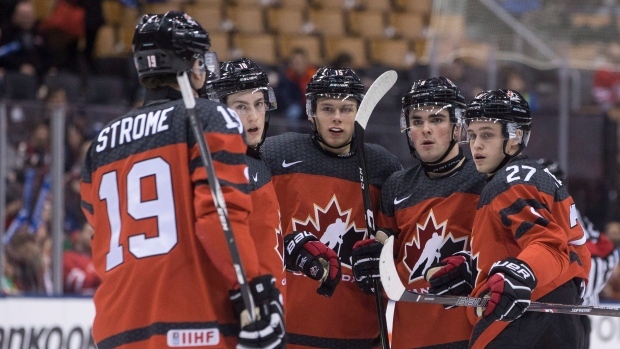 Dillon Dube made it 2-0 just over two minutes later, Dante Fabbro adding another a few minutes after that, his innocent-looking shot from the left point beating the Swiss goalie short-side for the 3-0 lead. Canada outshot Switzerland 6-1 after the first 12 minutes and 10-3 for the period. Snow piled up in the Swiss zone, the ice remaining pristine on the Canadian side. Hart wasn’t tested much at all, but did require one quality save in the early going. The Philadelphia Flyers second round draft pick denied Yannick Zehnder on a short-handed breakaway at one point, the Swiss forward getting his chance when Julian Gauthier’s stick shattered in the neutral zone on a Canadian power play. Switzerland came out strong in the second, finally sustaining some time in the Canada end. They broke through on an odd-man opportunity, Hischier taking a pass in the slot with speed and beating Hart. The 17-year-old Hischier, a potential top-10 overall pick in the 2017 NHL draft, has been called the “Swiss McDavid”. A rookie for the Halifax Mooseheads, he ranks among the QMJHL’s leading scorers this season with 48 points in 31 games. He added his second of the game about five minutes after the first, again off the rush. Defencenman Noah Juulsen was unable to close the gap on Hischier before he fired a shot past Hart. Canada still outshot the Swiss 7-4 in the period, but it was clear who the better team was. Switzerland scored their third goal to tie it in the opening minutes of the final period. Diem, who notched assists on both of Hischier’s goals, managed to gain a step on Strome as he strode through the slot, his shot just squeaking through the pads of Hart before crossing the goal-line. It was the third goal on eight shots to beat Hart, still likely to be Canada’s starter when the tournament begins on Boxing Day. Canada picked up its pace thereafter, Pierre-Luc Dubois nearly scoring on a strong drive to the net during a power play, Blake Speers grabbing another chance from the slot shortly after. The Swiss didn’t land another shot after their goal for more than 10 minutes, the Canadians noticeably more engaged and in gear, though unable to take advantage of a pair of third period power plays. Canada went 1 for 4 with the man advantage. Canada has been held without a medal in three of the past four world junior tournaments, including a stinging sixth-place showing last year. A day after the controversial cuts of two Ontario Hockey League stars, Team USA looked just fine in wrapping up its World Junior Championship pre-tournament play with a 4-0 victory over the Czech Republic. Alex DeBrincat, one of the most feared goal scorers in the OHL, and Logan Brown, another star from the Windsor Spitfires, both received their walking papers Thursday from general manager Jim Johannson. The moves send shockwaves through the OHL, particularly DeBrincat’s cut. He has scored 132 goals at the midway part of his third season with the Erie Otters. DeBrincat was also on last year’s Team USA squad, which took the bronze medal. However, Team USA has depth to its program which Canadian Hockey League supporters tend to look past. Seven of the Team USA players are first round NHL drafts from 2016 and 2015. Those include Tage Thompson, the strapping 6-foot-5, 200-pound right winger from the University of Connecticut. A draft of the St. Louis Blues Thompson scored twice in the first period. Thompson has scored 12 goals in 18 games at U Conn.
Colin White, an Ottawa Senators first-round draft, and Clayton Keller, the seventh overall draft last summer by the Arizona Coyotes, are with Thompson on what figures to be the top line for coach Bob Motzko. Team USA has a history of coming into Kingston with soon-to-be NHL stars. In 2015, it was the Buffalo Sabres’ Jack Eichel leading the charge for Team USA. Eichel would go on to be the second player picked behind Edmoton’s Connor McDavid. Toronto’s Auston Matthews was on the same team with Eichel. Coach Motzko, from the St. Cloud, Minn., does like the way his team has come through the pre-tournament play with a 2-0 record after Friday’s game played before 3,500 at the Rogers K-Rock Centre. “We think it was another good step for us moving forward,” said Motzko, adding that by putting five players back in the lineup who didn’t play in the team’s 4-3 win over Switzerland, the team’s demeanour was better right from the start. The Czech Republic did push back some in the second and third periods. Goaltender Joseph Wall, a Toronto Maple Leafs draft, made some good stops in the game’s second half. The best was when David Kase was awarded a penalty shot at 4:23 of the third period. Woll made a poke check when Kase stickhanded in close trying for the deke. “We thought he was a little nervous in the first but really settled down and was really strong. Very pleased with him,” Motzko said. The Czech Republic went with their 17-year-old goaltending star Jakub Skarek who was terrific after the first period. Team USA outshot the Czech Republic, 31-23. Team USA will play in the same Group B pool as Team Canada. The Americans schedule is almost ideal with building games against Latvia on Boxing Day, followed by Slovakia, Russia and finally against Team Canada on New Year’s Eve. “We think it sets up really well. Were not used to afternoon games and we have three,” Motzko said. Game notes: Czech Republic forward Filip Chlapik has 24 goals for the Charlottetown Islanders of the Quebec Major Junior Hockey League. Kingston’s Jim Hulton is the GM-coach of the Islanders, who are fifth overall in the Quebec league with a 20-12-1 record. Chlapik has recently signed a NHL contract with the Ottawa Senators…The Czech Republic, once considered one of the top four countries at the WJC has slipped out of that status, replaced by Finland. The Czech Republic won gold back to back in 2000 and 2001 and since has only had a bronze medal in 2005…Team USA forward Jordan Greenway was close to home territory. He is from Canton in upper New York State. Canton is about an hour away from Kingston…Team USA announced Luke Kunin as the team captain. Assistants are Colin White and defenceman Charlie McAvoy…Filip Hronek, who plays in the OHL for the Saginaw Spirit, is the captain for the Czech Republic. Liu Wendong does not care that the arena is mostly empty. He doesn’t care that he has come to cheer a team that shouldn’t even be here. He doesn’t care that this is not so much a sport as the plaything of billionaires or that the Chinese managers of the first Kontinental Hockey League team in China know almost nothing about the game – save that it supplies the kind of brutish spectacle that might, some day, appeal to a local audience. All Liu wants is to make enough noise to propel his team onward. “Kunlun!” the announcer at the Shanghai arena chants. “Red Star!” screams back the twentysomething Liu, a speed skater who now coaches hockey, waving the only flag on display in the stands. “I’m their No. 1 fan!” he says with a smile. When Presidents Xi Jinping of China and Vladimir Putin of Russia attended the signing ceremony for Kunlun Red Star in June, they heralded a new era of professional hockey in China, one that promised to transform the world’s most populous nation into the game’s biggest fan base. Since then, the team has had surprising success on the ice, but a stream of indignities off the ice. Unable to find suitable ice time in its home city of Beijing, Red Star has played all but one of its home games in Shanghai. Neither its cheerleaders nor many of the media who cover it have ever watched a game before. Management has struggled with the basics of equipping its players, who have gone so short on sticks that they have been forced to traipse around cities such as St. Petersburg during away games to buy their own. The team has plumbed new depths for empty seats in the KHL and is losing money badly on the $40-million (U.S.) it costs to run a season. It’s not clear anyone really cares – at least not for now. The team is hockey’s moon mission: an expensive attempt to do something no one else has accomplished. The Kunlun Red Star hockey club was born of a deal struck between Chinese oil and gas investor Billy Ngok Yan-yu and Gennady Timchenko, the Russian energy-trading billionaire who chairs the board of the KHL in addition to owning its top team, SKA Saint Petersburg. Yu “at the time didn’t know what hockey was. But he said, ‘Yes, definitely,’” says Ying, who watches games from a VIP area with the team’s top management. For his part, Timchenko brought not only hockey knowledge but political connections of the highest order. He is one of Putin’s confidants, and the Russian President in turn has a budding autocrat’s camaraderie with the Chinese President. So two of the world’s most powerful leaders witnessed the signing ceremony “for a team that has 1,000 people watch it if they’re lucky,” says Mark Simon, a well-connected Canadian who coaches hockey in Beijing. At a recent game in Shanghai, Red Star reported about 800 ticket sales. The stands looked well short of that figure. The team had given away a large number of tickets, and some fans had pockets filled with unused passes. No matter. The Chinese are playing the long game. Beijing will host the Winter Olympics in 2022, and the country’s leaders want as many medals as they can get. Red Star has skated several Chinese players alongside the Swedes, Finns, Russians and Canadians on its roster. Maybe, says team chief executive officer Emma Liao, the Chinese men can even make the top 12 at the Games. “With our help, the entire culture of the hockey industry can be very different,” she says. But they want to “charm” China with hockey, she says, launching into an MBA-style explanation of how the team provides an entertainment product for a rising Chinese middle class with time on its hands and an appetite for something new and Western – without the complicated rules of, say, American football. “It’s a high-contact sport, which is liked by Chinese audiences as well. And it’s easier to understand,” Liao says. Look at the $4-billion (U.S.) offer by a Chinese group for Ultimate Fighting Championship. “Chinese audiences like intense sports,” she says. If skating and stickhandling won’t bring the crowds, maybe violence will. Of course, they could come for the winning. Red Star has a .500 record and has spent most of the season in a playoff spot. Its players have shaken off 10-hour flights, six-hour time changes and the unfamiliarity of roast duck and chopsticks to play some remarkable hockey. Ying, meanwhile, is looking to solve the fan issue. He is calling his connections in the entertainment business, asking friends in the media to cover games and get scores on the radio. He has also convened an unusual brain trust, which includes Simon, to come up with solutions. Ticketing has been a “mess,” Simon says. The game-day experience is “horrible.” At a recent game, food and beverages were sold from a small table that included three Snickers bars and three plastic cups of caramel popcorn. There is reason for optimism. After its long sojourn in Shanghai, the team returned to Beijing on Dec. 12. The Chinese capital has far more hockey players and outdoor rinks in winter. The Red Star management team, meanwhile, is already turning its attention to find someone who can cover the hockey team’s losses. After all, they’re manufacturing a little slice of sporting glory for China. Why should they bear that cost alone? For the past three weeks, assistant sales manager Joewe Lam has doubled as a GrabHitch driver during his commute to and from work. The extra cash is not for Christmas presents but to help fund his and his fellow national ice hockey team-mates’ participation at next year’s Asian Winter Games (AWG). Almost half the 20-men squad have turned to GrabHitch to raise the $2,300 each needs to cover their flights and accommodation at the Games village in Japan. They also have to pay for the three team officials who will accompany them for the Feb 18-26 AWG. This is the first time Singapore is competing in ice hockey at the quadrennial Games, though it will be self-funded. The Singapore National Olympic Council (SNOC) classifies the AWG as a minor Games – others in this category include the Asian Beach Games and Asian Indoor and Martial Arts Games – and does not provide funding. It gives support only for selection, administration, logistics, sports science and uniforms and has provided the ice hockey squad with Team Singapore winter apparel. The SNOC coordinates the selection of Singaporean athletes for competition at major Games such as the Olympic Games, Asian Games, Commonwealth Games and SEA Games. He earns an extra $30 to $40 daily through GrabHitch and occasionally helps his father, who owns a delivery company, with odd jobs on some weekends. On top of funding their AWG participation, Lam and his team-mates pay for the cost of booking The Rink at JCube, Singapore’s only Olympic-sized ice rink, for training. The number of sessions has doubled in preparation for the AWG. “(Booking the ice rink) is not cheap,” said Singapore Ice Hockey Association (Siha) president Alphonsus Joseph. The financial burden could prove too much for 30-year-old forward Ignatius Ng, who is considering withdrawing from the squad. He lost his job managing a food and beverage outlet because the company closed down last year, and started his new job as a legal clerk just 11/2 months ago. “I really want to go (for the AWG), but my wife is pregnant and we just got our house, so money is tight for us now,” added Ng, who hopes to take up a freelance job as an inline-skating coach next month. Despite their struggles, the team was optimistic of a credible showing in Sapporo. The men’s competition is split up into three categories and Singapore are in the second-tier Division I alongside Mongolia, Thailand, Chinese Taipei, world No. 44 Hong Kong and No. 46 United Arab Emirates. Only the latter two countries have an official world ranking. The target is to finish third, said Siha president Joseph, and build on that momentum for the 2017 SEA Games in Kuala Lumpur, where winter sports make its debut. The Czech Republic have struggled over the past ten years at the World Juniors. Will they finally break the mold, or will it be back to being a mid-pack nation again. Goalies: For the third straight year, the Czech Republic are going with Daniel Vladar between the pipes. While his experience is going to be very welcomed on the Czech roster, the Boston Bruins prospect will surely have to improve his play from recent World Junior tournaments. In both events, however, Vladar went in as the backup to Vitek Vanecek, but as a 19-year-old in 2017, he’ll have the top spot all but locked up heading in. Vladar had an odd route to the North American pro ranks, having shined in a USHL role last year in junior before jumping to the Providence Bruins of the AHL. He’s got tremendous skill, no doubt about it, but he hasn’t proven himself at a high enough level yet that he can get the job done. He has already won silver medals for the Czech’s at the 2013 U18 World Juniors and 2014 Hlinka Memorial tournaments, so he knows how to win when it comes international hockey. But will it matter in Montreal this year, where the Czech’s are far from being top contenders? Defencemen: With five players in the CHL, the Czech’s have a fun base to work around defensively, even if they’re not as strong as the teams they’ll be facing off against. Their two best defenders, however, are Jakub Zboril and Libor Hájek, who are veterans to the international game. A smart, quick skating defenseman with the QMJHL’s Saint John Sea Dogs, Zboril will likely be one of the top blueliners at the tournament and having a lot of shots against will only help his case. Zboril, a 2015 Boston Bruins draft pick, played in his first World Junior tournament a year ago but has played nearly 100 games in a Czech uniform over the past few years, so the teams know what they’re getting out of him. Hajek, a second-round pick by the Tampa Bay Lightning this past year, will be making his World Junior debut for the Czech’s, but has also represented his nation numerous times. Hajek won a silver medal at the 2014 Ivan Hlinka, a tournament the Czech’s typically do well in. Offensively, Hajek isn’t much of a factor, but he still is a good shutdown defender that you can count on in the final minutes of a tight contest. Another intriguing name is Detroit second rounder Filip Hronek. The 18-year-old played at last year’s U20 tournament, putting up two points in five games. This year, while playing for the OHL’s Saginaw Spirit, Hronek is nearing a point-per-game average and is an ideal power-play candidate thanks to his accurate shot and great vision. Vojtěch Budík, a fifth rounder by the Buffalo Sabres, is more of a stay-at-home defenceman with the WHL’s Prince Albert Raiders, but has developed his offensive skills this year. And if you want to look away from North America, undrafted defender Petr Kalina will be a solid depth guy that has slowly evolved into a decent young player in the professional Czech league. Forwards: The Czech’s are weak up front, something that has yet to really change after the Czech’s dominance on the international scene in the 1990’s and early 2000’s. The one thing they do have, however, is a good amount of players that know to use the smaller NHL ice to their advantage, but with no Pavel Zacha, they’ll have to rely on other players to find the back of the net. One of those players is Adam Musil, who has actually represented Canada at the 2013 Under-17’s and 2014 Ivan Hlinka Memorial tournaments. The captain of the WHL’s Red Deer Rebels, Musil comes from a strong hockey background which includes two-time World Junior bronze medalist and Stanley Cup champion Bobby Holik. Musil has never been a top end scorer in junior, but he’s one of the best that the Czech’s have. Fellow Rebels forward Michael Spacek is playing the best hockey of his junior career, so there’s no doubt he’ll be relied on in Montreal. A silver medalist at the 2014 U18’s, Spacek has recorded six points in ten World Junior games over the past two years and should be counted on in a key leadership role. Tomas Šoustal has never been a strong offensive threat for the Czech’s, but he’s been a solid secondary option for them. A member of the 2016 World Junior team, Soustral is hoping to finish with more than just a single point in his final go-around for the junior squad. Soustral has a strong work ethic and plays every shift like he’s trying to prove something. If that doesn’t say enough about him, nothing else really will. Prince Albert Raiders forward Simon Stransky is a good option to skate on the first line for the Czech’s. Aiming for a point-per-game in the WHL, Stransky has looked good in previous national team performances, but not as much with the U20 team at last year’s World Juniors. Filip Suchý should also be counted on at points throughout the tournament, as he has adjusted well to playing on NHL-sized ice. And never, ever forget about Filip Chlapík, a scoring machine with the QMJHL’s Charlottetown Islanders. Chlapik is on pace for well over 80 points in his third season with the club, putting him eighth in league scoring after a strong start to the year. Projection: If the Czech’s are hoping to medal in 2017, they’ve got the odds stacked against them. The country hasn’t medaled at the U20 level since 2005 in Grand Forks, United States, and has finished fifth five times since then. Their best players are returning more experienced and stronger than ever, but the team still lacks overall talent and an underlying strength. They don’t have any tremendous weaknesses, but they do need to get lucky if they hope to contend for a medal in Montreal. They’ve avoided relegation two years in a row, but can Denmark stay alive at the home of their famous 2015 performance? Goalies: Two years after Georg Sørensen put on a performance of the ages, Denmark is still looking to find their next star goaltender to keep them in tight games. This year, they’re putting their hopes in Lasse Petersen, an undrafted prospect playing with the WHL’s Red Deer Rebels in Canada. Petersen has played for four WHL teams in just a two-year span, and while his individual stats aren’t the best, he’s been good at getting the job done. He hasn’t played much for the Danes internationally, but when he has, he’s been stellar. At the 2015 Under-18 Division IA championships, Petersen finished with the best SVS% (.937) and best GAA (1.60) to lead Denmark to the gold medal and earn promotion to the top division in the process. While named to the team, Petersen didn’t play in any of the World Junior games in 2016, instead sitting as the backup. At 19, Petersen is ready to thrust into the starting role and for Denmark’s sake, he better be ready to face 40+ shots a night. Defencemen: The blue line is Denmark’s weakest link, but that’s expected from a lesser-skilled team playing against the best nations in the world. Their best defenceman this time around is Christian Mieritz, a returning blueliner from the World Junior team a year ago. Mieritz split last season between the OHL’s Hamilton Bulldogs and Guelph Storm, but he didn’t do enough to keep in the league for 2016-2017. A fairly physical player that looked great in both Under-18 tournaments he played in for Denmark, Mieritz could use a bit of a break from the SuperElit league to recharge with the Danish national team as the group looks to avoid relegation for the third straight year. In terms of the back end, the Danes have another player skating in Sweden, and that’s Morten Jensen. Jensen, the most penalized player in the SuperElit this year, is known for his aggressive style around the boards but also sets up quite a few plays as well. Jensen has represented Denmark at multiple different tournaments in the past, including last year’s World Juniors. While those two will likely create the top pairing, the second duo should contain Rungsted pairing Mathias Rondbjerg and Nicolai Weichel. Rondbjerg has converted into a stay-at-home defenceman ever since joining the top Danish league last season. Now, he and Weichel are set to make their tournament debuts, and with experience playing against men already, hopefully they won’t take much time to adjust to such a big-game scenario. Forwards: Despite no real top end stars such as Nikolaj Ehlers, Denmark’s depth up front has never been deeper at the World Juniors. In fact, in keeping with recent tradition, the team will be bringing three NHL-drafted forwards with the likes of Joachim Blichfeld, Mathias From and Nikolaj Krag-Christensen. Blichfeld, a San Jose Sharks prospect, moved over to the WHL from the Swedish Malmö Redhawks squad, where he had spent two years developing in their minor league system. Now a member of the Portland Winterhawks, the strong winger with a tough shot has developed nicely with the WHL team, posting 12 goals and 28 points in his first 31 games with the club. Blichfeld was one of Denmark’s best players at the 2016 Under-18 World Championships, and while the team was constantly shelled and he himself finished with a -11 +/-, Blichfeld did finish with four goals and six points in seven games. From, a fifth-round selection by the Chicago Blackhawks, hasn’t put up big numbers with Rögle BK in the Swedish Hockey League this year, but as an 18-year-old prospect who has impressed in junior hockey, it’s nothing to worry about right now. From is considered to be a tough buzzsaw-type of player that isn’t afraid to get dirty and can match up with the toughest challenges you throw against him. He won’t bring the team a lot of goals, but he’ll surely scare a few people and you won’t find many better two-way guys on Denmark than From. The St. Louis Blues were impressed enough to draft Krag-Christensen this past June, and Denmark will hope to exploit him in his second World Junior tournament. Also a member of Rogle, Krag-Christensen has played mostly with the SuperElit U20 team, posting 13 points in 27 games. Also a member of the gold medal winning Division IA Under-18 squad from 2015, Krag-Christensen played even better when called upon to play in the top division in 2016, potting a goal and adding five assists for six points. More of a play-maker than a goal-scorer, Krag-Christensen was given a limited role at last year’s World Juniors, but expect him to be in a reliable top six role in Montreal this year. Another name to watch out for is Rasmus T. Andersson, a 19-year-old undrafted winger. Andersson, who was not a member of Denmark’s World Junior effort over the previous two seasons, has played extremely well with HV71 in the Swedish SuperElit league, tying him for second overall in league scoring. Another SuperElit forward, Jonas Røndbjerg, has been gaining some traction from NHL scouts prior to the draft and is nearing close to a point-per-game in 25 games played this year with the Växjö Lakers’ U20 squad. Fellow Lakers prospect David Madsen has also evolved his game this season as he hopes to gain NHL attention this spring. He likely will be put on the third or fourth line, but he’s got a lot to prove in the biggest hockey nation in the world. And to round it up, Alexander True is a name that will be tough to stop as he looks improve on his tournament performance from a year ago. He may be best known for being Ehlers’ cousin, but True would love to strengthen his play with the WHL’s Seattle Thunderbirds by having a strong World Junior performance. Projection: For the third straight year, the tournament darlings from Denmark will look to stay alive in the top division. And for the first time in that span, it looks like they may actually be good enough to do so. They don’t have any stars, but they have enough of a foundation to keep the team afloat for at least another year. They have many good young stars who will be back in 2018, which makes this year even more exciting. The fans are ready, so can the team live up to the hype and make it to the quarter-finals once again? The past three tournament champions that weren’t Canada have been won by teams who finished seventh the previous year. Where did Slovakia finish last year? Seventh. Goalies: Whenever Slovakia does well at international events, it tends to be because of their goaltending. In Montreal this year, the story likely will have to be the same. Adam Huska was one of the top goalies in the USHL with the Green Bay Gamblers a year ago, leading to him earning the starting role at last year’s World Juniors. The USHL Goaltender of the Year had a rather average World Junior tournament, playing on a Slovak team that really didn’t have a lot going for them in the first place. Prior to last year’s World Juniors, Huska represented his country at the Ivan Hlinka Memorial Tournament in 2014, going 0-3 in three games. A few months later, he acted as the starting goalie at the Under-18’s in Switzerland for Slovakia, once again playing on a weak team. While neither performance resulted in much success, Huska did shine enough to earn the attention of scouts, eventually leading the New York Rangers to use a late draft pick on him The Univ. of Connecticut netminder will be stuck in a very similar position of being outperformed by stronger teams, but he’ll still be a player to watch. Defensemen: Los Angeles Kings prospect Erik Cernak will, almost certainly, be the best defenseman on Slovakia and one of the best in the entire tournament. An assistant captain for Slovakia, this will be Cernak’s fourth straight World Junior performance which is impressive considering very few NHL prospects get this game chances in the prestigious tournament. He’s seen it all with the U20 team, and with one last kick at the can, he’ll want to lead his team to a decent result. After him, though, the team will be inexperienced in World Junior action, but that doesn’t mean there aren’t good options to work with. One of those players is Andrej Hatala, a hard-nosed defenseman that brings speed and skill to the blue line. While he doesn’t have as complete of a package as Cernak, he’s a stable blueliner that will be given every opportunity possible to thrive. 18-year-old defender Martin Bodak will have NHL scouts eyeing him closely this year, and after a very strong Ivan Hlinka tournament in 2015, there’s a really good reason why. Bodak has another year of eligibility ahead of him, but he’s already at the top of the Slovakian draft class for defensemen. Martin Fehervary is another fascinating underaged defenseman, with the 2018 Draft eligible prospect hoping to prove himself, albeit in a lesser role. He seems to be a leader whenever he represents his nation against players his own age, so how will the Malmö Redhawks defender do against the best junior players in the world? Forwards: The Slovaks don’t have a number one star like some of the stronger teams in the tournament, but Radovan Bondra is one of the closest bets. While Bondra’s surname may sound familiar, he actually is not related to Peter in any way. A fifth-round draft pick of the Chicago Blackhawks, Bondra is a huge 6’5, 218lbs forward that is almost impossible to stop when he’s around the crease. He’s not a big point producer, as evident by his 14 points in the final 28 games following the World Juniors a year ago, but he’s currently sitting at a point-per-game after 29 games with the WHL’s Vancouver Giants this year. Look for Bondra to be on the top line for the Slovaks once again this year. Centering Slovakia’s line will likely be Sarnia Sting forward Adam Ruzicka, a 6’4 power forward with tons of skill to boot. A likely third-round pick this year, Ruzicka recently captained Slovakia’s Ivan Hlinka Memorial tournament squad, putting up four points in four games for a team that won their first game since 2009. Ruzicka will be counted upon by the Slovak World Junior team over the next two tournaments as well, and will have a similar role improvement with Sarnia in the OHL during his time with the team. For now, he’s one of the most exciting European prospects to watch in this tournament. Finishing off the top line should be Samuel Solenský, who has adapted well in the American NAHL league. In his first 26 games while adjusting to life in the States with the Johnstown Tomahawks, Solenský has put up 20 points after recording three goals as captain of Slovakia at the Under-18’s this past April. He’s represented the Slovaks at various tournaments in different age groups, but the 18-year-old will be playing for his country at the World Juniors for the first time. Same goes for 2017 Draft prospect Marian Studenič, who has looked good in a supporting role for the OHL’s Hamilton Bulldogs this year. Studenič will be placed in a second line role for the tournament, alongside another star 2017 prospect, Samuel Buček. Buček has put up 23 points in 25 games with the QMJHL’s Shawinigan Cataractes, a strong response to his point-per-game performance with the Slovak U18 team a year ago. He’s done a great job every time he’s represented his nation, and this year is just the start of what should be a good national team career for the Nitra, SVK native. Miloš Roman will be given a chance himself, but at 17-years-old, there’s still lots of time to exploit his offensive skill. Projection: This team has a bit more optimism heading into the tournament than in recent years, returning to the site of their incredible 2015 bronze medal winning run. Slovakia has some talent at all positions and some of the best depth they’ve ever had, but that can be said about some of their stronger opponents, too. Look for Slovakia to be a mid-pack team, avoiding the relegation round and maybe giving a team a tough run in the quarter-finals, but that’s it. But, hey, the past three tournament champions that weren’t Canada have been won by teams who finished seventh the previous year. Where did Slovakia finish last year? Seventh. Switzerland has had a rough few years at the World Juniors, but with lots of future NHL prospects on the squad, there’s something to look forward to. Goalies: Having a familiar goaltender acting as your starter is always a good feeling for a team at the World Juniors, especially when you’re one of the weaker, more inexperienced teams in the tournament. Joren Van Pottelberghe may have had one of the roughest outings a year ago, getting shelled by the Americans late in the tournament, but that doesn’t mean he isn’t the guy to lead the team again this year. A Detroit Red Wings prospect, Van Pottelberghe has done a good job of leading HC Davos in his debut season as a starting goaltender, but won’t be joining the team in their annual Spengler Cup tournament due to the Juniors. He probably won’t mind, as he will want redemption for a tough tournament a year ago. Van Pottelberghe has looked good internationally previously at the World Junior A Challenge and Under-17 Hockey Challenge, two events put on by Hockey Canada. Can he regain his form with the Swiss national team? He’ll be facing a lot of shots every night, so he better. Defensemen: For the third year in a row, Jonas Siegenthaler will be one of Switzerland’s top defensemen. A Washington Capitals prospect, Siegenthaler has the ability to crush an opponent along the board, but his strength doesn’t seem to transfer over to his shot. Still, Siegenthaler will be a minute-crushing defender will be used more as a defensive defender than a shooter, and that’s exactly how he thrives. Siegenthaler looked good in six games with the Hershey Bears of the AHL last year in the United States, but his time to play a full professional season in North America has not come yet. In terms of experienced defenders, Yanik Burren is another 19-year-old that will be counted on in comparison to the younger talent. Burren has never represented Switzerland in an official IIHF tournament prior to this year but was once his nation’s captain at the U18 level. Burren looked very strong with Bern U20 at the Junior A level in Switzerland this year, earning a promotion to EHC Visp in the Swiss B league after a five-game stint in junior. The Swiss, however, have two good young prospects to look forward to. Starting the fun is 2017 NHL Draft prospect Tobias Geisser, a star member of the EV Zug NLA club. Geisser used to play as a centreman, but transferred back to the point and it has done wonders for his game. A rising NHL prospect, Geisser has split the season between the top two Swiss men’s leagues, the NLA and NLB. Geisser likely won’t play much in this year’s tournament but will be relied on in the next few years. Nico Gross is in that boat too, with Gross expected to play in the Under-18’s in April. Gross is just one of two 16-year-olds in the tournament, but he deserves a chance. He won’t see much playing time, but the 2018 NHL Draft prospect has proven his worth in the NLB this year. Forwards: With almost all of the forwards being 19-years-old, the Swiss will have an experienced group up front to work with. Leading the charge is centreman Calvin Thürkauf, a seventh-round pick by Columbus at the 2016 NHL Draft. Named captain for the tournament, Thürkauf will look to improve upon a two-point performance a year ago for a team that will need offense big time. One of Switzerland’s best players at the 2014 World Junior A Challenge, Thürkauf has been one of the best players on the Kelowna Rockets with 31 points in 28 games, and only trails Kole Lind for the team lead. The biggest star on the team, however, will likely end up being Nico Hischier, an almost sure bet to land in the top five in the NHL Draft this year. The small, speedy centreman has taken the QMJHL by storm this year, putting up 48 points in 31 games in his first year with the Halifax Mooseheads, good to put him sixth in the entire league and first for all imports. Hischier put up two points as a 16-year-old a season ago, where he finished with an Elite Jr. A Championship with the Bern U20 squad. Switzerland has a star on their hands, and potentially their best ever, with Nico Hischier. The Swiss have 10 players capable of playing down the middle, and Philipp Kurashev is one of them. Kurashev likely won’t be used down the middle, as the goal-scoring winger seems to excel on the left side. The son of Rapperswil U20 head coach Konstantin Kurashev, Philipp has 29 points in 32 games with the QMJHL’s Québec Remparts this year. Like Hischier, Kurashev is eligible for the 2017 NHL Draft and is hoping to use the World Juniors as a way of moving up in the eyes of NHL scouts. A couple Swiss players had a strong Four Nations tournament in Norway earlier in the year, and Raphael Prassl is one of them. Tied for second in tournament scoring with three points in three games, the 19-year-old helped the Swiss win a silver medal in the multi-day event in his first ever U20 tournament for Switzerland. Marco Miranda also had a similar performance, scoring twice on four total shots and adding an assist in a top line role for Switzerland. A quick, offensive forward, Miranda was dynamite for Switzerland at both the U16 and U17 level and it has transferred over well ever since joining the NLB’s GC Küsnacht Lions last year. In terms of drafted prospect, Damien Riat, a future Washington Capital, is hoping to cap off his time at the World Juniors with a strong follow-up performance to his four-point effort a year ago. A second-year forward with NLA club Genève-Servette HC, Riat is a good skater and plays a game that will work well in North America. Other players to watch out for include 17-year-old Nando Eggenberger, who looks poised to be drafted in the top 60 in the 2018 NHL Draft. and former NA3HL star Yannick Zehnder. Projection: Switzerland is always an interesting case at the World Juniors because they always have a few prospects to look forward to, but the team never truly meshes. This time, they’re bringing an older team that can find the net, and with one of the top prospects in the entire 2017 NHL Draft on their team, they have something to look forward to. But don’t expect them to go far this year once again unless they truly steal a game or two in Montreal. Finland will be without their best players from the 2016 gold medal championship-winning World Junior team, but they still look poised for another good run in Montreal this year. Goalies: When you look at the reasons as to why Finland won the 2016 World Juniors, it’s unlikely anyone would point to Veini Vehvilainen as a reason why. Kaapo Kähkönen was their guy when it mattered most, eventually giving Finland the 4-3 overtime victory over Russia. Now, it’s Vehvilainen’s turn to take back the reigns and win another medal, this time as the starter. Vehviläinen was named to the Finnish U18 World Junior team, and with USA, Russia, Czech Republic and Canada all bringing fairly strong rosters, it was going to be tough for the Finns to find themselves in the finals. As the cards were dealt, Finland indeed found themselves playing for a gold medal, large in part due to the play of Vehviläinen. One of the better goaltenders in the entire tournament, Vehviläinen made sure to save the best performance for last. Easily the best performer in the game, Vehviläinen made 60 saves in the final game against the Americans (including this magnificent grab near the end of the contest), a game which was as one-sided in the puck control department as it can get. Unfortunately, Finland would end up dropping a 2-1 decision in overtime, but regardless, it was easily one of the best goaltending performances by any draft prospect in 2015. A member of JYP in the Finnish league, Vehvilainen could be one of the best goalies at the World Juniors this year, but he just needs to step up his play this time around. If not, fellow 19-year-old netminder Karolus Kaarlehto could steal the crease away from him, but with almost no international experience, they’ll likely stick with Vehvilainen instead. Defencemen: Finland has built a strong defensive base with the young defencemen that have gone through the ranks through the years, and now they’ve got potentially one of the best pairs in the entire tournament. Leading the way is 19-year-old Vili Saarijärvi, a Detroit Red Wings prospect with over a point-per-game with the OHL’s Mississauga Steelheads. Named Top Defenseman at the 2015 U18 World Championships, Saarijärvi has a key member of Finland’s gold medal-winning effort in 2016. He also has some pro hockey experience to his credit, recording four points in five games with the ECHL’s Toledo Walleye. Saarijärvi has the offensive tools to dominate, while Vancouver Canucks draft pick Olli Juolevi has the complete game covered. Juolevi, who has been tremendous with the London Knights this year, also was a member of Finland’s championship squad from the last tournament, putting up an incredible nine assists as a big, minute-crunching defenseman despite being younger than most of the competition. Compared to most of Finland’s roster, Juolevi knows the smaller NHL ice very well and his speed, skill and strength will be valuable in Montreal. 2017 NHL Draft prospect Robin Salo will be another name to look out for. Salo, a threat to land in the first round this year, has adjusted well to life with Sport in the men’s Liiga. He also had a strong effort with Finland at the most recent Ivan Hlinka tournament, scoring twice for a weak Finnish roster. Joining him in the underaged bracket is Miro Heiskanen, a potential top ten pick this coming June. Heiskanen has played very strong with HIFK in Liiga this year, and has proven himself to be more than just another youngster in a men’s league. Juuso Valimaki, who plays for Tri-City in the Western Hockey League, should also be a strong top four option on a team riddled with talented youngsters. There’s no question that the Finns will have some good defencemen to work with, but it will definitely feature a lot more youth than some of the other contenders for gold. Forwards: Without the big three prospects, Sebastian Aho, Jesse Puljujärvi and Patrik Laine, on the roster, you’d think it would be really tough to score when the team suits up in Montreal this year. Nine 2017 NHL Draft eligible prospects were named to the forward core for Finland, so it’s clear that they aren’t done churning out tremendous talent at the junior level. Two of those Finnish stars include Eeli Tolvanen and Kristian Vesalainen, names that will surely get called early in June. Tolvanen, a star with Sioux City of the United States Hockey League, had 14 goals and 24 points in 21 games at the time of getting announced to the selection roster, which put him third in the entire USHL. Tolvanen’s quick legs and smart decisions with the puck, especially on the power-play, has worked out very well for him on the smaller NHL ice, so he’ll have a distinct advantage over many European players in Montreal. Vesalainen, meanwhile, is a very strong choice to land in the top ten of the NHL Draft and could play in a scoring role for his country. A big power-forward with skill to kill, Vesalainen performed well in the summer camp tournament run by the United States and should be a used effectively by the Finns. But what about the veterans? If it wasn’t for his 5’7 frame, Petrus Palmu would be one of the hottest prospects on the scene. Currently in his third OHL season with the Owen Sound Attack, Palmu has been a scoring master so far this season, putting up 23 goals and 44 points in 32 games before joining Finland. Julius Nättinen, the brother of former World Junior forward Joonas, is primed for a strong sophomore experience at the tournament. An Anaheim Ducks prospect, Nättinen put up three points in seven games for the eventual champs last year. He hasn’t been up to the dominant offensive pace that saw him record 71 points in 52 games last year, but with just under a point-per-game average in 2016-2017, he’s definitely not disappointing. New York Islanders prospect Otto Koivula and Carolina Hurricanes draft pick Janne Kuokkanen should provide extra offense while future Edmonton Oiler Aapeli Rasanen puts his hat in the ring as one of the team’s best centremen. Projection: With 19 players from the 2017 draft selected to the initial training camp roster, the defending champions are coming in with a lot of young prospects looking to prove themselves. That can create some healthy competition that only makes the team better out of the gate. This tournament is very wide open and repeating a gold medal is not going to be a simple task, but whenever Finland is written off, they seem to come back and win everything. We’re in a golden age for Finnish prospects, and fans of the junior team will be pleased with what they see from them this year. Latvia is participating in the top division of the World Juniors since 2013, and while they have a stronger team than the team they’re replacing, Belarus, they will have an extremely tough time trying to stay alive. Goalies: There is no question that this is the most important position on the team, as is the case for any outmatched international hockey team. Last year’s goaltender, Matīss Edmunds Kivlenieks, graduated to the men’s age bracket so he won’t be able to make an appearance when it matters most. Gustavs Davis Grigals should be the guy to watch this year after backing up Latvia at the Euro Ice Hockey Challenge in November. He has another year in him if they manage to stick up for another tournament, but the Dinamo Riga will need to play quite outstanding to get the job done since they’ll be heavily outmatched in every single contest. Defence: The lowest ranked team in the World Juniors always has a rough time defensively, and that’s to be expected again with Latvia. But with a core group of the defensemen currently 19-years-old, that does help them a bit when playing against some tough, older competition all-around. One of the better defenders is NCAA blue liner Karlis Cukste. A fifth-round selection by the San Jose Sharks in 2015, Cukste is a big, two-way defender who will almost certainly finish as one of the top scorers on Latvia. His transition to the NCAA with Quinnipiac has seen Cukste record nine points in 19 games prior to the World Juniors, which are great stats for a rookie defenseman. Joining him on the top pairing should be Medicine Hat Tigers defensemen Kristians Rubins. Competing in his third straight U20 tournament for Latvia, Rubins has five points in ten games in Division IA action with his country, while having competed in various other tournaments along the way. In WHL play, Rubins is also sitting at .500 when it comes to offense, scoring 13 points in 26 games after transferring over from VIK Västerås HK in Sweden over the summer. Another third-year member of the U20 team is Maksims Ponomarenko, who is seen more as a defensive defenseman. Having scored just a single goal in ten games, Ponomarenko will likely be used in a physical, shutdown role compared to the previous two defensemen. Eduards Hugo Jansons could see some time with Ponomarenko after a good pair of exhibition games against Kazakhstan early in December, while Kristaps Zile looks to impress again after captaining Latvia in 2016. Forwards: Perhaps the best offensive option for Latvia lies in the hands of Martins Dzierkals, a third-round draft pick by the Toronto Maple Leafs in 2015. This will be his third, and final time representing Latvia at the U20 level in an official IIHF tournament, with the Latvian star putting up eight points in ten games over the past two Division IA tournaments. He’ll be a leader after skating as an underaged forward the past two years, and that’s promising for a team looking at a strong result to stay alive for another year. He’ll be joined by San Jose Sharks prospect Rudolfs Balcers on the first line, with Balcers playing well with the U20 team in exhibition contests last year. Erlends Klavins should be the number one centre for the team, with the 18-year-old poised to make his U20 team debut for Latvia. Klavins performed well for the U18 team last year, putting up six points in seven games, and has been a valuable third-line option for the USHL’s Omaha Lancers. In terms of 2017 NHL Draft prospects, Latvia has a few names to choose from. One of those is Oshawa Generals forward Renars Krastenbergs, one of Latvia’s best players at the 2016 Under-18’s thanks to eight points in seven games. Just 17, Krastenbergs has impressed with ten points in 30 games in the OHL this year, but should evolve into something even stronger in the future. Deniss Smirnovs, who skates with the Genève-Servette U20 team in Switzerland, has shown strong flashes this year in Junior A and has earned attention from NHL scouts as well. Other strong players on the roster include Erlends Klavins, who has adjusted well in his initial campaign in North America in the USHL, returning U20 forward Rihards Puide and University of Maine commit Eduards Tralmaks. Projection: Unlike Belarus the year before, who had three players eligible to return from their Division IA winning team to the top tournament a year later, Latvia had 11 returning options to choose from. Unfortunately, that’s not going to be enough to keep their hopes alive, and their odds of a victory against the likes of Canada, Russia or USA just aren’t likely. Their best bet is to take down Switzerland or Denmark in the regulation round, but even that will be a challenge in its own. While the team does have some bright spots, scoring won’t be their forte. Like most bottom-ranked teams, Latvia will need to rely on playing strong defensively and hoping to chip in occasionally with a few goals here and there. Just don’t expect them to compete for anything other than one of the two bottom spots.